Anna Marie Schwieder was born in St. Louis, Missouri on September 22, 1922. She was the third daughter born to Mary and Edward Schwieder. Although one might assume that Anna Marie is German, she will quickly point out that her mother’s maiden name was Mary Mahoney and that her grandparents came from Ireland. In fact, her grandfather claimed to have been born on St. Patrick’s Day! Anna Marie’s family were members of St. Margaret’s Parish in St. Louis. She attended St. Margaret’s Grade School where she was taught by the Sisters of St. Joseph. She later graduated from McKinley High School. After completing her high school education, Anna Marie went to work for Anheiser-Busch Brewery in St. Louis. While she was working there, she attended a weekend retreat at the Cenacle. She had hoped for a quiet time and a little extra rest. However, Monsignor Driscoll, the Retreat Director, gave a talk on religious vocations. Anna Marie was one of only two young women in a large group of older women; since the other young woman was about to enter the Sisters of St. Joseph, Anna Marie felt the vocation talk was directed to her personally. So much for a restful weekend! Anna Marie later talked with Monsignor Driscoll about religious life. Soon he invited her to attend a profession ceremony of the Hospital Sisters of St. Francis in Springfield, Illinois. When he asked her if she would consider entering a nursing community, she answered emphatically that it would be the last thing she would consider. However, God had different plans for Anna Marie! After her visit to Springfield, Anna Marie pondered and prayed about her future. While she did not believe she could be a nurse, she felt drawn to the Hospital Sisters. Her friend who entered the Sisters of St. Joseph told Anna that she must make her own religious habit. Anna Marie hoped that if she was expected to do likewise, she would be eliminated immediately. However, God had other plans for Anna Marie and on February 1, 1948, she entered the Hospital Sisters of St. Francis. Upon completing her postulancy and novitiate, Sister Anna Marie began her studies at St. Louis University. 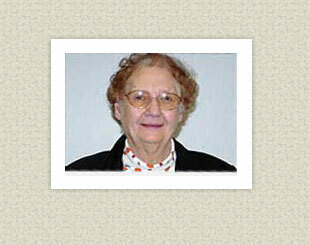 She obtained a Bachelor’s Degree in Medical Records Administration in 1956. After serving as the Director of Medical Records at St. John’s Hospital in Springfield, Illinois for ten years and at St. Mary’s Hospital in Streator, Illinois for two years, she returned to school. In 1971, Sister Anna Marie obtained a Master’s Degree in Counseling Psychology from Loyola University in Chicago. The next few years were filled with many exciting and innovative events for Sister Anna Marie. She needed a practicum for her Clinical Pastoral Education and someone suggested that she apply to Lutheran General Hospital in Chicago. She was unaware that she was the first woman to participate in the program. Upon completion of her practicum, Sister Anna Marie returned to St. John’s Hospital in Springfield and started the Pastoral Care Department. Soon she developed 10-week programs for Sisters to obtain basic skills in Pastoral Ministry. Later, she was involved in planning a Hospice Program at St. John’s; she participated in a three-week course in Sheffield, England as part of the development of the program. Sister Anna Marie feels that her work within Pastoral Care was a blessing, and it was a privilege to be welcomed into people’s lives at a very special time. Sister Anna Marie began her ministry at St. Elizabeth’s Hospital, Belleville, Illinois in 1986. She served in the Pastoral Care Department for about 10 years. At the present time, Sister is involved in a variety of volunteer ministries as well as grief support groups. She remains active in the Belleville Community. Her lifelong support of the St. Louis Cardinals has grown since she relocated close to St. Louis. Often she finds her way to Busch Stadium to cheer for her team. Since Sister has never had a driver’s license, she is the self-proclaimed expert on bus and metro transportation in Belleville! A retreat at the Cenacle in St. Louis changed the direction of Anna Marie’s life. Because of her openness to God’s grace, she has had a life full of challenges, opportunities, and growth. She will soon celebrate her 82nd birthday; there are no signs that this vibrant woman will lose her zest for life anytime soon!